A cookie cannot give Yorkshire Medical Marketing access to your computer or any information about you, other than the data you share with us. Cookies cannot be used to track your browsing activity on any other websites either. Analytical/performance cookies: We use analytical cookies which enable us to recognise and count the number of visitors and to see how visitors move around our website. This helps us to improve the way our website works, for example, by ensuring that users are finding what they are looking for easily. Third party targeting cookies: These cookies allow you a better experience when using other third party websites in conjunction with the Yorkshire Medical Marketing website, which include social media sites and payment providers. Yorkshire Medical Marketing does not collect or store your personal information alongside this analytical information, so it cannot be used to identify who you are. We use Google Analytics and Visitor Analytics to collect information about how people use our website. We do this to make sure the website meets the needs of its users and to understand how to improve it. Google Analytics & Visitor Analytics: shares information about what pages you visit, how long you are on the website, how you found the website and what you click on. We do not collect or store your name, address or other data you have provided to us alongside this information. 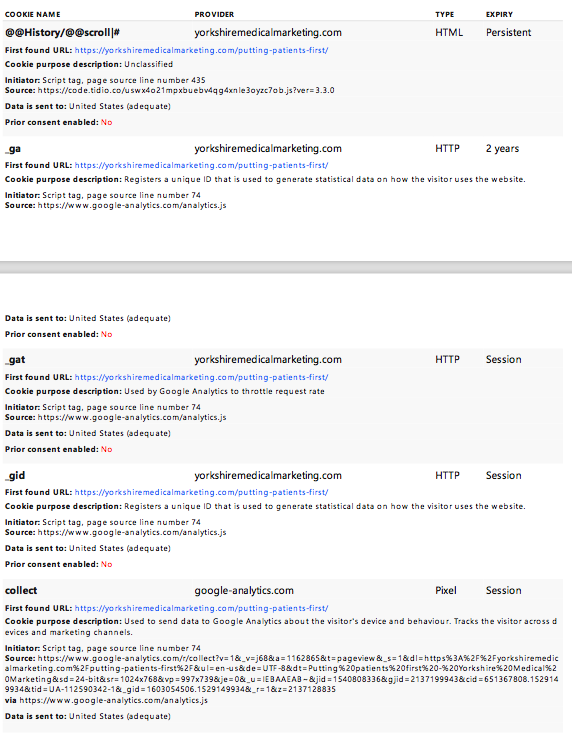 We do not allow Google to use or share our analytics data. You can find out more about Google Analytics on their website. If you fill in certain forms on our site – for instance, the chat bot, Tidio – you will be given the option to tick a box in order to remember your details for the next time you fill out the form. If you chose this option, we will store your details in a cookie. If at any time you wish to disable cookies or our website, you may do so through the settings on your browser. If you do this, please be aware that you may lose some of the functionality of this website. If you do not want your information shared with Google Analytics, you can install a Google Analytics opt-out plugin. You can find out more about this plugin and how to install it on Google’s website.